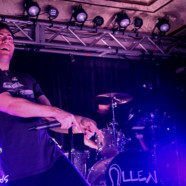 Three albums into his career, Hoodie Allen is one of the hottest rappers in the game today. This third record- The Hype couldn’t have a more fitting title and he brought his 2017 Fall Headline Tour (named after the album) to Indianapolis for the second night of the tour and the house was completely packed. The night started early with opening sets from Luke Christopher and Myles Parrish, which got the crowd warmed up but didn’t see as much participation and excitement as you’d hope for. Maybe they were just saving their energy for Hoodie, though because the crowd completely lost it when he took the stage. One thing that has to be touched on is Allen’s backing band. These guys have got to be one of the most underrated and impressive bands in all of music- not just hip hop. 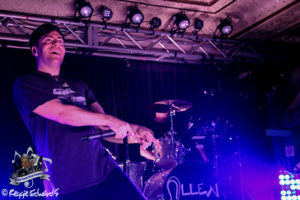 The chemistry they have with Allen is unparallelled and is just fun to watch as Allen makes sure they aren’t just a backing band but they’re a vital part of the entire show. Allen knows exactly how to give the fans their money’s worth and what they came for. 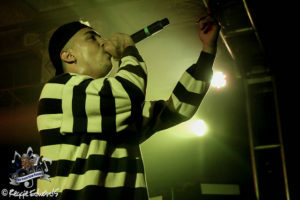 With three albums out now, he’s seasoned enough to know how to put on a good show but still new enough that he has the fire, hunger and drive to raise the bar with every show. In Indianapolis, he took full advantage of being two shows into the tour and was as energetic as ever and it was infectious. He made sure to not just get the crowd involved- he brought the show to them by launching Hoodie Allen-branded dollar bills into the crowd with a fake gun, throwing a cake into the crowd during “Cake Boy” and even surfing atop the crowd with a giant raft toward the end of the show. In the end, it didn’t matter if you were the biggest Hoodie Allen fan in the world, if you’d just discovered Allen or if you were just at the show for a good time- regardless, you left a bigger fan than you were when the night began and many fans left already eagerly waiting for Allen to make his return to the Circle City.